I figured now was a good time to go back and revisit some of those spots whose fried chicken sandwiches I tried. Or in the case of RT Rotisserie, savaged. In case you don't want to click and read, I believe I said it was more cabbage than actual fried chicken and even that was dull and uninteresting--though not necessarily in those exact words. Basically I didn't like it or its price. 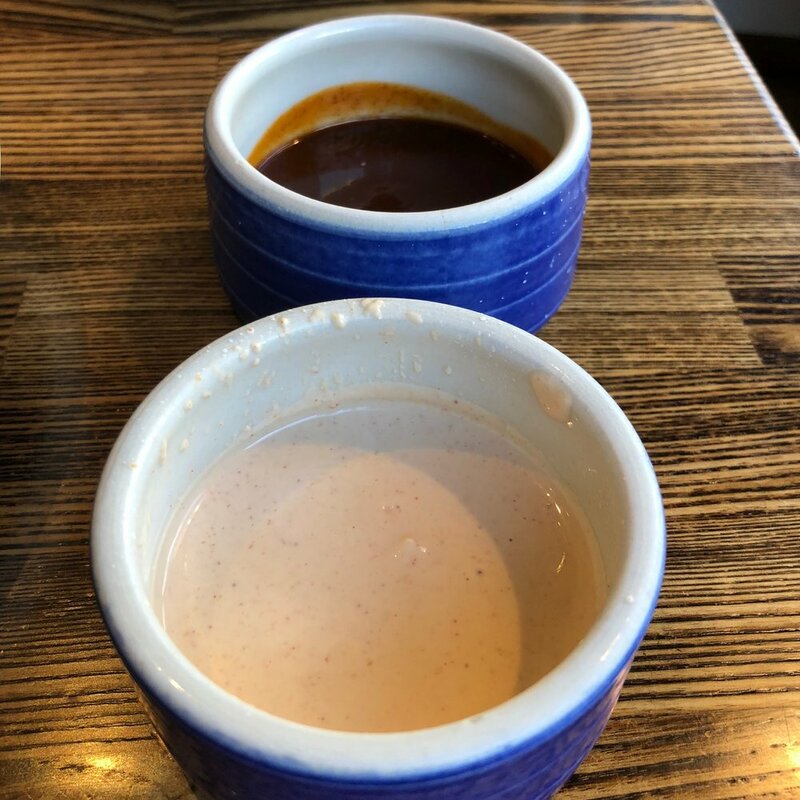 But that didn't stop me from giving them another shot in order to try other menu items that seem to be more in line with what they have become known for--actual rotisserie chicken. 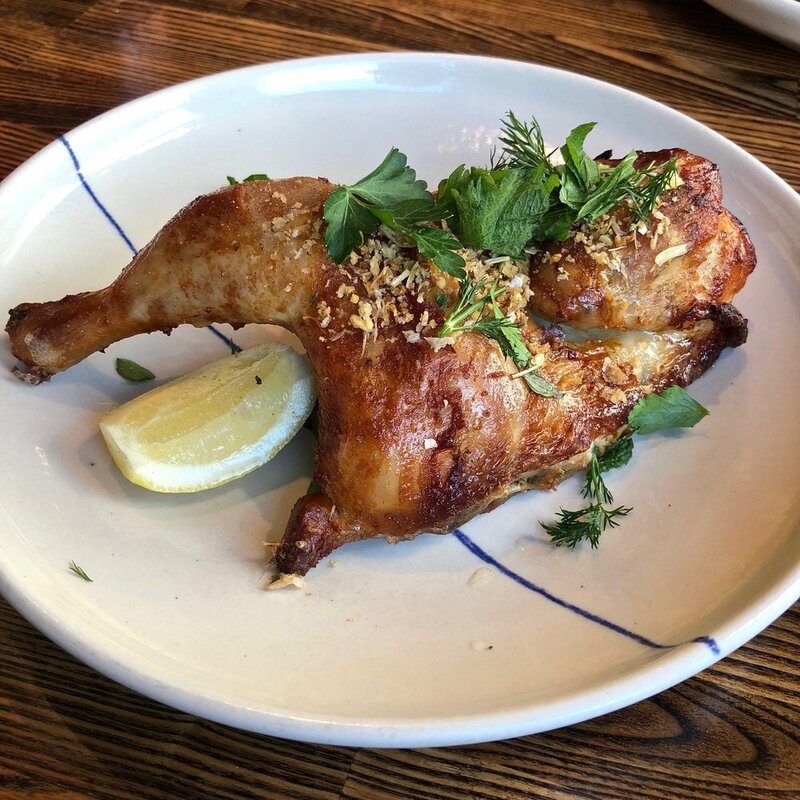 Located in Hayes Valley, they are an offshoot of Rich Table a few blocks away and have taken their signature chicken and given it its own restaurant to shine in. Or maybe that is just the reflection of the sun in the chicken grease. Either way, looking at the menu, some of the sides seem to be just as interesting as the chicken. The chicken comes in a half or whole and then you can choose from a handful of sides to go with it. All of it is geared toward sharing even though I'm dining solo so I opted in for just the half. I mean, I didn't want to make a pig of myself! HA! Okay, you all know that isn't true, I just wanted to try some sides also so a half seemed the better idea. And it really is a half, cut right down the middle of the bird. Sprinkled with crispy garlic bits and what I'm pretty sure were mint leaves and some dill. Evidently the chicken is brined and buttermilk soaked for like a day or something then rotisserie'd. What it produces is quite some tasty and juicy chicken that is for sure. This was the complete opposite of the fried chicken fiasco. The skin is super crispy and I could have just eaten a whole bowl it like cracklins'. The meat is so tender it almost falls right off the bone. Add in the wonderful dripping grease of the chicken and it is like some savory delicacy you just can't get enough of. It really doesn't need any additional seasonings or sauces, yet you do get to choose two with a half bird for dipping if you so please. I went classic with Nanny's bbq sauce which wasn't as thick as I like and a tad on the sweet side. And something a little different (and now kind of signature for them) in the Douglas fir sour cream. You can actually taste the fir! Though I can't say I was particularly enamored of the flavor profile. Maybe a little too close to a smoky green grass kind of thing. Definitely a personal taste choice for folks on these. I was happy with just the chicken as is. Since I was already eating chicken I wanted to stay in the mode of ordering healthy-ish when it came to side dishes and went all veggie. When I got this I was a little surprised--it was huge! Two giant bunches of seared broccoli covered in chimichurri sauce and more of those garlic chips and mint and dill like leafy things. Seems to be a theme. They cooked this just right. Somewhere between soft enough to cut with a butter knife but with still enough crunch to make it interesting. It also had a tangy chimichurri sauce slathered over it which initially tasted strange in combo with the broccoli but after a few (or more) bites it kind of grew on me. I say kinda as I would say ask for the sauce on the side so you can decide whether you like it enough to go all in and all over with it. And I just could not pass up roasted cauliflower. It is a whole head of cauliflower roasted in chicken fat! How can that not be good! Which it most definitely was. As you can see in the video it cut so easily with a fork and had such great flavor. Roasted to soft/crunchy like the broccoli and with a lovely brownish color on the blooms. Sure, it looked a little like a cooked brain, but tasted so yummy I didn't think it necessarily needed the beet tahini cream you see. At first I was looking forward to the beet cream since I'm a beet fan but it tasted more of tahini and not my fave. Maybe a side of the chicken grease for dipping instead? I'd be willing to give it a try instead of butter, that is how much it added to the flavor of what can sometimes be a bland vegetable. Again you can see it has more of those garlic and green theme things and like the chicken, I think the cauliflower stands on its own without all the periphery. While I will most definitely get this again, I would also go sauce on side here too. Besides the same toppings which are prevalent throughout, the other is the portion size. All of these really are made for sharing and I had plenty to take home for a couple more meals. The whole chicken is $19 and while that may seem a lot compared to say a particular stores rotisserie chicken, I think if you are looking to upscale a bit for a picnic or family dinner night, it is a pretty good way to go especially when you add in some of the sides to round out the meal. Plus, if you don't do the meat thing, they really do have enough different vegetable side options to choose from you won't feel left out since not everything is roasted in chicken fat. Which is a bit of shame as it smells so good and tastes so yummy. I guess the lesson I learned for RT Rotisserie is to stick with stuff that just happens to be in their name. The fried chicken sandwich didn't cut it by any standards but the rotisserie chicken and that roasted cauliflower are definitely a couple of my new favorite dishes and probably should be yours too.